Aww, tranquility. That sounds pretty amazing, right? But spend just one day in my home and you'll find... well, you'll find you WON'T find tranquility. You'll find messes, you'll find drama, you'll find chaos. Tranquility!? I cannot even imagine what that looks like anymore. So there do we find that little bit of tranquility in the hustle and bustle of it all? 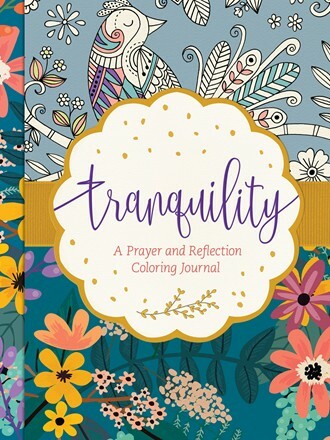 Today I'm sharing something that might just help- Tranquility: A Prayer and Reflection Coloring Journal. I must admit, this might just be the most beautiful journal I have ever seen, and I own quite a few. I have typical journals. I have coloring journals. I have devotional journals. I even have journals that allow room for doodling. But this one so perfectly combines many of these aspects all into one. Most pages have a short reading and reflection with space to journal your thoughts on the topic. Others simply offer a brief prompt and space to doodle your responses. Throughout there are beautiful illustrations. Some are partially colored and allow you to complete them on your own, others are completely blank so you can do what you please. Journaling, coloring and art journaling are all wonderful forms of worship...and this truly does combine them all. Now, it's not an island away from all the hustle and bustle and responsibilities of life... but it CAN provide you with a little break from it all for at least a few moments of tranquility. Tranquility is available to purchase now. What a great journal! It looks beautiful! I love that they use coloring to promote tranquility, prayer and mindfulness. These are things I could definitely use more of in my life!